In my previous blog post I wrote about the use of Lapis Judaicus, a ‘stone’ used to cure bladder stones, as a form of sympathetic medicine. Sympathetic medicine is a term used to refer to historical medical practices in which a cure is ‘sympathetically’ related to the condition it treats; it relates to, involves, depends on, acts on or is effected by ‘sympathy’, a real or supposed affinity, correspondence, or occult influence, as the OED puts it. The more I read and thought about it, the more I realized that the relationship between cure and disease in sympathetic medicine can take many different forms. We can roughly distinguish between material and immaterial sympathetic medicine. The latter would be spells and incantations, but as my regular readers will understand, I am more interested in the various appearances of material sympathetic medicine. So far, I have been able to distinguish three different kinds, but I’d love to hear about other examples! Hanger to cure toothache. 19th century, silver and tooth. Deutsches Medizinhistorisches Museum Ingolstadt, Inv.-Nr. 12/028. Photograph: M. Kowalski. Probably the most common and widespread were cures based on the idea that substances similar in colour, shape or substance to the body part, bodily fluid, or cause of the patient’s misery would make a good cure. Well into the eighteenth century, apothecary handbooks were full of recipes containing predominantly red ingredients that were prescribed to strengthen the blood or the heart. Similarly, snake-like grasses were recommended to cure snakebites, powdered human skull to alleviate a headache, et cetera. 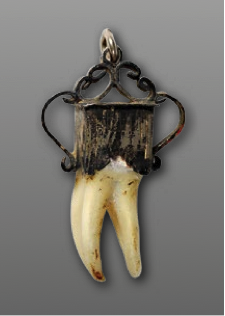 Another curious example of this ‘similarity principle’ I saw in an exhibition at the Charité Museum in Berlin last year: a nineteenth-century human tooth in a silver hanger, to be worn around the neck to cure toothache. Another strain of material sympathetic medicine is that in which the cause of the ailment is also used as the cure. The oldest example I know of is described in the classical legend of Telephus, who was wounded in battle by Achilles’ spear. The wound only healed when scrapings from the spear were applied to it. It is this same principle that underlies a nineteenth-century paramedical practice that is still used by some today, namely homeopathy. 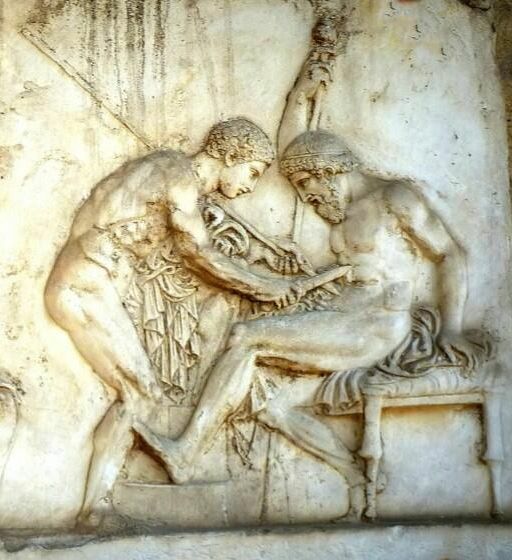 In my book, I also mention an eighteenth-century poem in which Achilles’ spear is used as a metaphor for the budding practice of inoculation, but when you think about it, that’s not entirely the same of course: inoculation is preventive medicine. The third kind of material sympathetic medicine I call the ‘pars pro toto kind’, for want of a better name: treating bodily material of the patient (like excrements) or the object or substance that caused the ailment rather than the patient himself. The most famous early modern example I know about is weapon salve: a substance applied to the weapon that caused a wound, rather than to the wound itself. It was already hotly debated by the seventeenth century, as has been described in detail in this blog post by Issei Takehara as well as in Dutch by professor Mart van Lieburg, and it had all but disappeared by the eighteenth century. Do you have a favourite example of an early modern sympathetic cure? Please share!